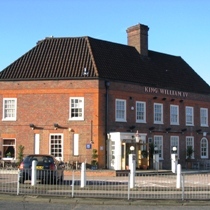 The King William is a large pub halfway between St Albans and Sandridge. Although it doesn't look anything special from the outside, it is bright, smart, comfortable place for a drink and/or meal. A few years back the King William was a slightly run-down pub with a carvery. The Jim Thomson thai food chain then took it over and it was run as a Thai restaurant for a couple of years. Around 2004 Ember Inns bought the pub and it is now a well-run pub that serves food all day until 9pm. At the time of the review the real ales available were: London Pride, Timothy Taylor Landlord, Bitter and Twisted, Caledonian and Rev James. We were quite lucky as it was the start of one of their beer festivals, although normally Pride, Landlord and a guest ale are available. The King William has a nice friendly atmosphere with a good mix of drinkers right from early twenties through to people in their fifties. Early evening many people tend to come in for a meal whilst later on there are many smartly dressed, and some not so smartly dressed, drinkers in their twenties, thirties and forties. Music is played in the background. Quiz nights are held on Wednesdays and Sundays. Seating is comfortable ranging from leather sofas to bar stools. The King William is a fine pub with good ales and food and is great place to relax and unwind after a days work. The credit crunch doesn't seem to have affected the King William. It was very busy on a Thursday evening with most tables taken. Many customers come to the King William for evening meals; on Tuesday they have a steak night (steak and drink for £5.99) and Thursdays is curry night (curry and drink for £5.99). Timothy Taylor Landlord is very good and there are normally two or three other ales available. Popular for food midweek. Patio at front but overlooking busy road and mostly in the shade. Still no wi-fi.